Typing ‘Minehead to South Haven Point, Dorset’ into Googlemaps, reveals that travelling between the two can be completed in a matter of 3 hours 37 minutes by car, along a distance of 96.6 miles. Even walking, along the most direct route, takes only around 29 hours, so Googlemaps says, with the path an even shorter one at just 89.3 miles. It is these two points that are connected by the South-West Coast Path (SWCP). This most famous – and infamous – of national trails is, however, a good deal longer than 89.3 miles. Though estimates as to its exact length vary – and to a large part are determined by which of the alternative paths one takes at various stages along the trail – the most widely accepted estimate of the path is that it is about 630 miles long (1014km). That figure, however, often changes due to necessary changes in the path caused by erosion and other factors. So why, when you could walk from Minehead to South Haven Point in just 29 hours, do most people choose to take 6-8 weeks? The answer is simple: the SWCP is one of the most beautiful trails in the UK. Around 70% of those 630 miles are spent either in national parks, or regions that have been designated as Areas of Outstanding Natural Beauty. The variety of places crossed by the SWCP is extraordinary too: from sun-kissed beaches to sandy burrows, holiday parks to fishing harbours, esplanade to estuary, on top of windswept cliffs and under woodland canopy, the scenery that one travels through along the length of the SWCP has to be the most diverse of any of the national trails. Of course, maintaining such a monumental route is no easy task. A survey in 2000 stated that the trail could boast 2473 signposts and waymarks, 302 bridges, 921 stiles, and 26,719 steps. These figures are, of course, out of date now, though they do still give an idea of both how long the trail is, and how much is involved in building and maintaining it to such a high standard. The task of looking after the trail falls to a dedicated team from the official body, Natural England. 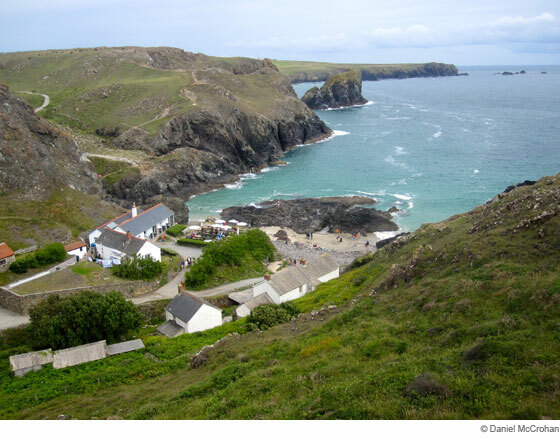 Another particularly important organisation and one that looks after the rights of walkers is the South West Coast Path Association (see p46), a charity that fights for improvements to the path and offers advice, information and support to walkers. They also campaign against many of the proposed changes to the path, and help to ensure that England's right-of-way laws which ensure that the footpath is open to the public – even though it does, on occasion, pass through private property – are fully observed. In 1948 a government report recommended the creation of a footpath around the entire South-West peninsula to improve public access to the coast which, at that time, was pretty dire. It took until 1973 for the Cornwall Coast Path to be declared officially open and another five years for the rest of the South-West Coast Path to be completed. The section covered in this book, North Devon and Exmoor, is the first part that most coastal walkers complete, though it was actually the last section to be opened to the public, in 1978. The origins of the path, however, are much older than its official designation. Originally, the paths were established – or at least adopted, there presumably being coastal paths from time immemorial that connected the coastal villages – by the local coastguard in the nineteenth century, who needed a path that hugged the shoreline closely to aid them in their attempts to spot and prevent smugglers from bringing contraband into the country. The coastguards were unpopular in the area as they prevented the locals from exploiting a lucrative if illegal activity, to the extent that it was considered too dangerous for them to stay in the villages; as a result, the authorities were obliged to build special cottages for the coastguards that stood (and, often, still stand) in splendid isolation near the path – but well away from the villages. The lifeboat patrols also used the path to look out for craft in distress (and on one famous occasion used the path to drag their boat to a safe launch to rescue a floundering ship). When the coastguards’ work ended in 1856, the Admiralty took over the task of protecting England’s shoreline and thus the paths continued to be used. The SWCP officially begins at Minehead in Somerset (its exact starting point marked by a sculpture that celebrates the trail), heads west right round the bottom south-west corner of Britain then shuffles back along the south coast to South Haven Point, overlooking Poole Harbour in Dorset. On its lengthy journey around Britain’s south-western corner the SWCP crosses national parks such as Exmoor as well as regions that have been designated as Areas of Outstanding Natural Beauty (including North, South and East Devon AONB and the Cornwall and Dorset AONBs), or Sites of Special Scientific Interest (Braunton Burrows being just one example – an area that also enjoys a privileged status as a UNESCO Biosphere Reserve), and even a couple of UNESCO World Heritage sites, too, including the Jurassic Coast of East Devon and Dorset and the old mining landscape of Cornwall and West Devon. Other features passed on the way include the highest cliffs on mainland Britain (at Great Hangman – also the highest point on the coast path at 318m/1043ft, with a cliff-face of 244m), the largest sand-dune system in England (at Braunton Burrows), England’s most westerly point (at Land’s End) and Britain’s most southerly (at the Lizard), the 18-mile barrier beach of Chesil Bank, one of the world’s largest natural harbours at Poole, and even the National Trust’s only official nudist beach at Studland! The path then ends at South Haven Point, its exact finish marked by a second SWCP sculpture. The path also takes in four counties – Somerset, Devon, Cornwall and Dorset – and connects with over fifteen other long-distance trails; the southern section from Plymouth to Poole also forms part of the 3125-mile long European E9 Coastal Path that runs on a convoluted route from Portugal to Estonia. In terms of difficulty, there are those people who, having never undertaken such a trail before, are under the illusion that coastal walking is a cinch; that all it involves is a simple stroll along mile after mile of golden, level beach, the walker needing to pause only to kick the sand out from his or her flipflop or buy another ice cream. The truth, of course, is somewhat different, for coastal paths tend to stick to the cliffs above the beaches rather than the beaches themselves (which is actually something of a relief, given how hard it is to walk across sand or shingle). These cliffs make for some spectacular walking but – given the undulating nature of Britain’s coastline, and the fact the course of the SWCP inevitably crosses innumerable river valleys, each of which forces the walker to descend rapidly before climbing back up again almost immediately afterwards – some exhausting walking too. Indeed, it has been estimated that anybody who completes the entire SWCP will have climbed more than four times the height of Everest (35,031m to be precise, or 114,931ft) by the time they finish! Given these figures, it is perhaps hardly surprising that most people take around eight weeks to complete the whole route, and few do so in one go; indeed, it is not unusual for people to take years or even decades to complete the whole path, taking a week or two here and there to tackle various sections until the whole trail is complete.